Alan Greenspan, who chaired the Federal Reserve from 1987 to 2006 with an abiding faith in private-sector bankers that cracked a bit in the ensuing financial collapse, is peddling another book — Capitalism in America, with Economist writer Adrian Wooldridge. And the Constitution, as updated, guarantees "individual rights, and as a consequence property rights, which give you all sorts of incentives” to learn, work, save, invest, and succeed. We can still learn from other nations: Greenspan sees Sweden as a model — not so much for generous social benefits but because it killed the most expensive one, a guaranteed pension whose cost was a drag on investment and jobs. Greenspan has long argued that the United States cannot afford Social Security, Medicare, and Medicaid on today’s terms. That’s because there are not enough workers, and taxpayers are getting squeezed to finance retirees and patients. “Every dollar of entitlement increase reduces gross domestic savings in the U.S. by $1,” a claim that he says he once doubted but that he has validated from economic data. It’s not enough to fix Social Security and medical costs. As more citizens stop having babies and the president tells immigrants that America is full, the population is aging fast (the average Pennsylvanian is over 40) and there are fewer workers paying into medical and retirement plans compared with the numbers retiring. That’s a drag on investment and growth. 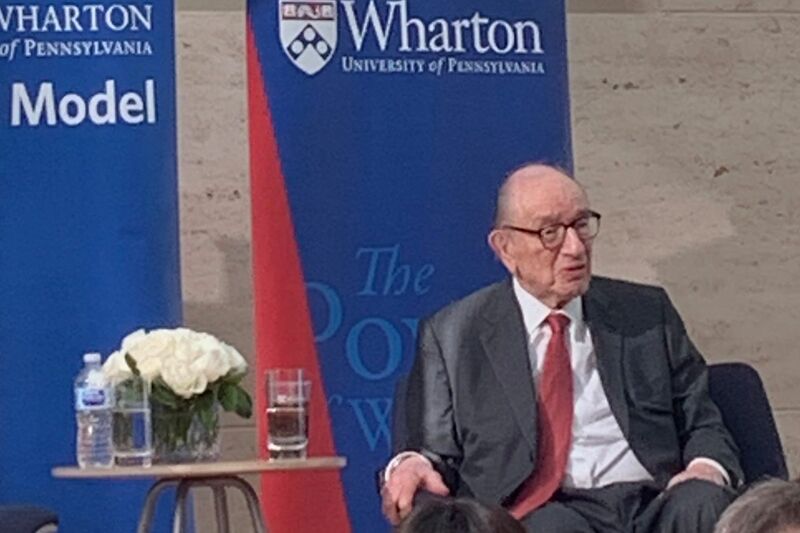 Greenspan worries that it’s a self-reinforcing process: “When [annual GDP growth slows] from 3.5 percent to 2 percent, you get populism in the White House” and Europe, in movements like the U.K. attempt to leave the European Union. Smetters, who serves on a Social Security technical-advisory committee, asked how Greenspan would advise extending Social Security so it doesn’t start running low on funds for the next generation. “They’ll have to cut benefits 24 percent” or boost taxes, he said. What about the fast-growing federal deficit? “Politically, deficits really don’t matter" — until trillions in debt and bank payments pile up, driving interest rates and prices higher — and by then it’s hard to stop, unless the government cuts benefits, another “major political problem,” Greenspan said. Inequality is fed in part by new technologies, which tend to boost profits for their providers as older sectors lag. People might not be getting smarter, but better tools give us “higher and higher technical capabilities," which are now “going up faster than the capability of the average human being to handle" them — which results in “an increasing portion of income going to smaller and smaller groups." So it’s important for social stability, Greenspan said, to “find ways to teach people with normal intelligence to do a job that’s done by people with higher intelligence” using those same technologies. Smetters pressed Greenspan on his legacy: Did his years of granting Americans “easy money” at low interest rates when he ran the Fed, plus reduced regulation under his admirers, Presidents Reagan, Bill Clinton, and the Bushes, provoke the Great Recession of the late 2000s? China grew fast in the 1980s and 1990s as it granted Western-style investment freedoms. But China’s current president, Xi Jinping, has instituted aggressive central-control policies that have slowed that nation’s growth, Greenspan said. The “political changes” that have accelerated under Xi — whose government, as Greenspan didn’t spell out, has suppressed independent criticism, mass-imprisoned Muslims and members of other minority groups, and demanded corporate support for Communist Party initiatives — mean that China is “no longer what it was under [reformer] Deng Xiaoping.” That leaves the U.S. as a world leader. “Creative destruction” has moved basic U.S. industries to cheaper countries, while software, medical and robotics technology thrive here. That’s natural for a rich country; Greenspan said: Policies dedicated to “resurrecting” old industries would only drive up prices and erode U.S. national income and living standards. Smetters asked if Trump-style tariffs and trade restrictions will push China in the right direction. Greenspan laughed. “A tariff is a tax” on “your own citizens,” who pay import fees, he pointed out. Neither side wins a trade war — both end up paying more for goods. Greenspan described China’s lack of income security as a social benefit: workers there, lacking Social Security or Medicare, save a lot more of their pay than Americans, which banks and insurers invest in companies and other property. High savings feeds higher capital investment, which “creates increased productivity, higher standards of living.” He agreed it would be politically tough to get Americans to agree to go back to that kind of country.